When it comes to first appearances BO2’s Green Run Trazit mode looks like your everyday ordinary Zombie mode with a few minor tweaks and improvements. After a few games, however, you realize that it has far more depth than any Zombies level has ever had. I’ve already written a lot about the level in other posts on the site but people come asking new questions all the time so this is the complete guide.covering everything to know about Green Run Tranzit. The guide on this page is already massive and it’s only going to grow more and more! I’ve set everything out in individual, easy-to-find, sections. 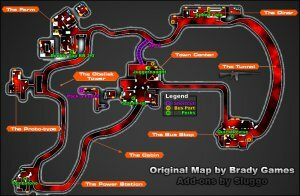 Green Run Zombies map showing the locations of the perks and shortcuts. There’s also a few locations you can find hidden in the fog. The Cornfield – where Nacht Der Untoten and the Pylon is found in the Corn Maze. As you can see there is also a shortcut after the Diner leading to the Town. There’s a nice map that I found (shown on the right) showing the locations of the perks and shortcuts. Sluggo on the Call of Duty Zombies Forum made it using the map from the Official Brady Games Black Ops 2 Guide. There are a total of 3 upgrades for the bus. the Grill, the Roof Hatch and the Ladders. Attaching all 3 parts to the bus unlocks the Undead Mans Party Bus Achievement. The Grill is the only one that can damage Zombies giving an instant kill on impact. Use the Roof Hatch to get on the roof of the bus from the safety of inside the bus. Use the Ladders to climb to the roof of the bus from outside the bus. There is 4 possible locations for the Bus Parts. All 4 locations need you to open the door with a turbine. The first site is at the Bus Depot through the door that needs a turbine. Second site is at the far end of the Diner in a shed next to a lamp-post. The third place for a bus part is at the Farm behind the truck at the top of the path. Final place for the bus upgrades is the Town – directly across from the ground location of the mystery box. Can the Roof Hatch only be Used Once? Yes, the Hatch can only be used once but there are 2 locations where you can use it – on the bus and in the Diner to reach the Galvaknuckle. Right when you start playing Tranzit on Green Run you start in a room at the Bus Depot with only 2 exits. One of them costs 750 points to unlock the other way says “You require a source of power to open this door”. To open the door that needs a power source you must place a Wind Turbine nearby to power it. The Perk-a-Cola machines are turned on by placing your turbine down next to them but they must continue to stay powered if you want to enjoy the benefit of the perk. To give permanent power to all of the perk machines throughout the level you must turn on the power at the Lab. The 4th area of Green Run is where you find the Lab. It’s at the stop after the Farm but before the Town. Turning on the Power requires you to find the 3 pieces of the switch and build it at the workbench in the Lab. When you get off the bus there will be a shed with an AK74-u on the side for you to buy. Open the door and jump in. There is a small corridor where you enter, a big circular white room and a 3rd room with the bench and build spot for the switch. There is also an extra room through the shutter door with an upstairs and downstairs – this is how you exit the white room. I’ve written a previous guide detailing all possible locations of the items to turn on the power that you may be interested in. To open the Pack-a-Punch machine you must drop a Wind Turbine at the green lightning logo in the Lab. Then you must make it to the Town where you will be able to enter the corridor where you can build the Pack-a-Punch machine. To use the Pack-a-Punch you need to build it on the Workbench with the 3 pieces found in the corridor and you need to have the power turned on. Once you have it built, and the power is on, you can place your weapons in it for upgrade – at the cost of 5000 per weapon. You can also upgrade some weapons farther or change the scope on the weapon at the cost of another 2000 points. There is a complete list of weapons and their upgrades in the How to Build the Pack-a-Punch machine post. Turbine – used to power doors and other items. Breaks after a while. Zombie Shield – used to smack Zombies. They go flying but you earn no points from the kills and it breaks after a few hits. Machine Gun Turret – automated turret that shoots Zombies. Must be powered with a Wind Turbine. Electric Trap – electrocutes any Zombies that gets near it. Needs power from a Wind Turbine. The other 3 buildable items are special buildables. The Wind Gun – This is the Wonder Weapon in Green Run Tranzit. The Pack-a-Punch machine – used to pack-a-punch (upgrade) your weapons. The Nav Table – the use for this, outside of Tower of Babble, is yet to be found. The vault in the bank has a few purposes. Primarily it is for storing money for later games and pulling it out when you need it. Holding the action button at the right key places points into the vault for use later – every 1000 you place allows you to withdraw 900. To get your points back out you simply hold the action button at the left key. There is a second door in the Vault too, inside you will see a very small room with a green lightning logo. That whole wall moves to show the stairs to the pack-a-punch room by placing a turbine at the green lightning logo in the power station. The 3rd thing to note about the Vault is that there is another set of glowing keys on the desk just outside of the main Vault door. At these keys you can give or lend money to other players. There’s a total of 5 achievements up for grabs in Green Run Tranzit. There’s the large ‘story’ or ‘Easter egg’ – Tower of Babble – but the rest of them you can just get by playing the game trying to reach the highest wave you can. Tower of Babble has its own section of this guide so I’ll only be covering the other 4 available achievements here. To get Fuel Efficient you must teleport between any two of the green lamp posts. I recommend you get this at the Bus Depot when you start a match. Simply power the lamp-post behind the bus with the your Wind Turbine and lead a Denzian from the fog beneath it to create a teleport hole you can jump into – unlocking the achievement. You unlock Dance on My Grave by collecting your tombstone once you die.Tombstone is one of the new perks in Black Ops 2 Zombies – it allows you to reclaim your weapons and perks after you die. To get Tombstone you should get off the bus after the Farm, turn on the power in the Lab and then buy use the perk-a-cola machine in the room behind the shutter door to buy a Tombstone Perk. You then need to get downed and not be revived by a team-mate – you can press the action button to kill yourself as soon as your downed – this will leave a floating Tombstone for you to collect when you next respawn When you collect your Tombstone you will be given your weapons you just lost and your perks minus the Tombstone. To unlock this achievement you have to put all 3 of the bus upgrades on the bus. The ‘Bus Upgrades’ details where all the parts are. Happy Hour is unlocked by obtaining 2 perks before the power is turned on. If you place your Turbine at an un-powered perk machine it will power up allowing you to buy the Perk. When you remove your turbine the perk’s power disappears until the machine powers up again, via a Turbine or the Power Switch. 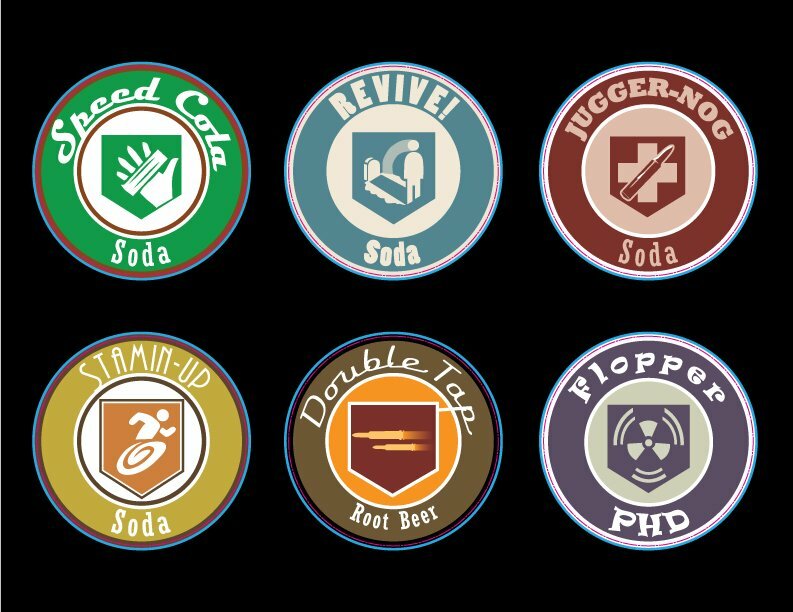 There’s 3 perk machines before the Lab – Quick Revive, Speed Reload, Double Tap. Quick Revive and Double Tab are the 2 cheapest to buy costing 1500 and 2000 respectively. Speed Reload is 3000. There are many way of successfully playing Tranzit but here’s a few Pro Tips to keep you on top of your game. There’s 3 confirmed perma perks in Tranzit. Each one gives you a pretty big advantage when playing. You know when you’ve unlocked one because you get a green puff of mist on-screen when you do. The perma perks are only semi-permanent but they last a long time, particularly Quick Revive. Quick revive allows you to revive other players really fast. It’s the same as actually buying the Quick Revive perk only.To unlock this perma perk you have to revive other players between 14 and 18 times in a single game. If you combine this with actually buying quick revive the time it takes you to revive other players is just 0.5 seconds. Unlock Deadshot Daiquiri by performing a head-shot kill on 2 zombies with a single bullet. When you have this the aim assist naturally pulls towards the head of a Zombie. The upgraded barriers look like they’re steel, or have steel reinforcements. They take longer for the zombies to pull off than ordinary barriers. Unlock this by repairing around 50 barriers at the same window. If your interesting in finding out more about the perma perks, or want video guides on how to unlock them and what they do check out my other perma perks guide post. There is shortcut to town located just after the Diner. The purple line on this map is the shortcut. Jump on the bus at the Diner as it is leaving. After you leave the Diner you will pass a lamp-post in the fog. Directly after that lamp-post is a semi-truck. The shortcut to town is there, on the left when heading the direction of the Farm. You can also run to this shortcut from the Diner but there is a pit of lava you need to run over and hope nothing hits you before, during or after running it. You can give money to your fellow players at the 2nd set of glowing keys in the bank. They are located on one of the desks just outside of the Vault. To lend money you need to have a Galvaknuckle. You can give it in increments of 5000. Go prone and punch the keys and a $ sign will appear on the other side of the desk with another player can pick-up.